Trump’s Wall Is Coming to Texas. Meet Its First Victims. Now Reading: Trump’s Wall Is Coming to Texas. Meet Its First Victims. As soon as February, the border wall is headed for a state park, a butterfly refuge and the land of a Hispanic family who’s called the Rio Grande Valley home since before it was the United States. In his late 40s, Cavazos began losing the strength in his legs — the result of a polio-like virus — and he uses a wheelchair now. Divorced, he lives alone in a house just a 2-minute drive from his land on the river. With help from a sister, who lives next door, and a cousin, he stays busy enough: On the same acreage his family farmed, he tends a handful of cattle and goats and helps with landlord duties for about 30 riverside lots that the family rents out. The rentals bring in about $30,000 a year, which supplements Cavazos’ Social Security and his sister’s pension. But Donald Trump has other plans for Cavazos’ land: He aims to put it on the wrong side of a 30-foot border wall. On a cold November morning, Cavazos and his cousin, Rey Anzaldúa, take me to visit the family property. In Cavazos’ cargo van, we cross the highway in front of his house and drive up onto a gravel road that runs atop the earthen river levee. Much of the Rio Grande Valley is protected from floods by such levees, which sometimes run hundreds of yards north of the river. As we pass, Border Patrol agents wave from their SUVs parked alongside the road. An access road running down the levee’s south slope is how Cavazos gets to his land, but if Trump has his way, that’s precisely where a towering concrete and steel wall will stand. It’s possible Cavazos will get an electronic gate for access, but the government isn’t making any promises. Either way, he worries he won’t be able to maintain his livestock, and he’s confident his tenants will lose interest in family gatherings in a new no man’s land between Mexico and Texas. As we enter the property, Cavazos opens the van’s side window and lets out a yell, “Vénganseeeee!,” and two cows, a bull and a calf come bellowing into sight. Cavazos cackles with satisfaction. “This is what keeps him going,” Anzaldúa says. “They take this away from him, I don’t think he lasts long.” Cavazos nods. “It’s like… a purpose, verdad?” he says. In March, Congress shelled out $641 million for 33 miles of new wall in Hidalgo and Starr counties in Texas’ Rio Grande Valley — a fact all but forgotten amid the ongoing reality TV-esque spat over Trump’s demand for an additional $5.7 billion. That mileage represents the first truly new wall under Trump, and Cavazos is set to be among its first victims. His land is part of a 6-mile stretch where a Galveston-based contractor, SLSCO Ltd., has been paid to start construction of the wall in February. The same segment includes private farmland, a pair of federal wildlife refuge tracts, the Bentsen-Rio Grande Valley State Park and the National Butterfly Center, a private 100-acre nature and wildlife sanctuary. In all, as many as 31 tracts of land could be bisected or cut off by this single span of wall. In Texas, the U.S.-Mexico border is a river, and 95 percent of the adjoining land is privately owned. Anywhere Trump builds his wall in Texas, he’ll have to wrench land from farmers, ranchers, entrepreneurs and deeply rooted Hispanic families. Just downriver from Cavazos’ land, for example, lies a stretch that includes an RV park frequented by Winter Texans, a bar and grill that offers river cruises, and the historic La Lomita chapel. (No construction contract has been awarded there yet, but the feds expect to do so in March, according to court filings.) Upriver, in neighboring Starr County, sits a more densely-populated target: the poor and flood-prone border town of Roma, sister city to Ciudad Miguel Alemán. In all, Customs and Border Protection (CBP) sent letters to nearly 600 landowners in Starr and Hidalgo counties last year, advising them of its interest in taking land for the wall. The 33 miles of wall slated for Hidalgo and Starr counties will cost at least $19 million per mile. Cavazos is attempting to battle the feds in court with the help of the Texas Civil Rights Project, an Austin-based nonprofit. When the government asked Cavazos last year for permission to survey his land — a necessary precursor to eminent domain — he balked, forcing the U.S. Justice Department to take him to court. But on December 12, a federal judge swatted down Cavazos’ arguments and ruled he had to let contractors survey, which they did about a week later. Soon, the Trump administration will likely move to take part of his land for the wall. The Texas Civil Rights Project has promised to keep fighting, but all it can likely do is slow the process and ensure that Cavazos one day gets a fair payout. “We’re working to make sure landowners know their rights and aren’t railroaded like last time,” said Efrén Olivares, an attorney with the civil rights group. A joint project of CBP and the Army Corps of Engineers, the wall is expensive even without the cost of eminent domain litigation. Based on congressional funding, the 33 miles of wall slated for Hidalgo and Starr counties will cost around $19 million per mile. But contracts awarded so far have been even costlier: The 6-mile stretch that includes Cavazos’ land is running taxpayers $24 million per mile. That’s up sharply from a decade ago, when an average mile of border wall cost only $6.5 million, according to the Government Accountability Office. None of those figures account for the legal costs of acquiring land, or future maintenance. The feds also plan to clear out a 150-foot “enforcement zone” south of the wall, eliminating vegetation and razing structures as needed. Patrol roads will run through the zone, which will be laced with ground sensors, surveilled by camera towers and illuminated by flood lights all night long. For Cavazos, the enforcement zone could deprive his cattle of high ground necessary to survive bad floods. Nicol describes the whole project as an environmental disaster: The zone’s lights will disrupt nocturnal wildlife; the levee wall will trap terrestrial animals when the Rio Grande swells; and the bollard fencing will get clogged with flood debris, “becoming an impermeable barrier and bouncing water into Mexico.” In 2017, federal wildlife biologists raised many of the same concerns, but their comments were censored by Interior Department officials. On a Wednesday afternoon in November, around 20 cars are parked in front of the center. 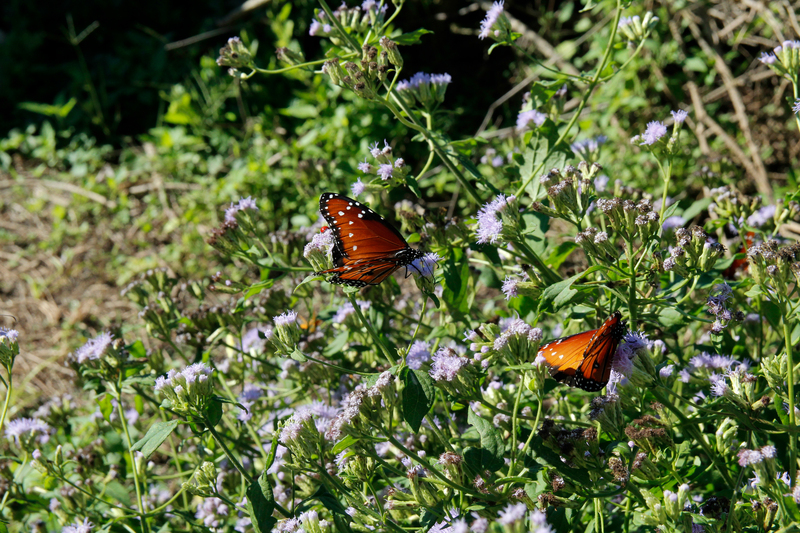 Queen butterflies flit among blue mistflowers. A few birdwatchers have arrived in search of a roadside hawk, a rarity in the Valley, recently spotted in the area. From the welcome center, visitors can see the humble earthen levee, set to become a “concrete and steel monstrosity” as soon as February. With permission from the association that oversees the center, federal contractors surveyed the land in December, and the government will likely seize the land soon. Environmental protection laws could shield the butterfly refuge, but the feds have cast off such burdens. Thanks to a 2005 act of Congress, the Department of Homeland Security has a special anti-terrorism authority to waive historic preservation and environmental laws. In October, the agency waived 28 federal statutes for 14 miles of wall in Hidalgo County, including the 6-mile stretch set to run through the butterfly center. The Supreme Court declined to hear a challenge to the government’s waiver power in December. A mile down the road from the butterfly center, federal contractors also surveyed Bentsen state park late last year, with permission from the Texas Parks and Wildlife Department. The 766-acre park, home to native riparian woodlands and rare species including the northern aplomado falcon and the indigo snake, draws more than 30,000 visitors a year. The wall there will separate the visitors’ center from the rest of the park. In a 2017 letter, the state’s parks and wildlife director, Carter Smith, wrote that the wall would “be a significant deterrent to visitors” and could force his agency to close the park. For Bentsen and the butterfly center, there does remain some slim hope. In Washington, D.C., a divided Congress is at loggerheads with Trump over his demand for $5.7 billion in additional wall money. In whatever funding bill emerges, some border Democrats hope to include exemptions for certain sites in their districts: Laredo Congressman Henry Cuellar, who voted “yes” on the 33 miles of wall in March after helping secure protection for the Santa Ana National Wildlife Refuge, said he hopes to protect La Lomita, Bentsen and the butterfly center. Brownsville Congressman Filemón Vela, a “no” in March, aims to save Elon Musk’s spaceport-in-progress near Boca Chica Beach. It’s unlikely, however, that anyone’s coming to save poor landowners like Cavazos. Anzaldúa has a stake in the property too, through a shared uncle who died without a will. He joins us on the dock and relates the family’s history. Like many Valley landowners, Cavazos and Anzaldúa can truly say the border crossed them. Both trace their ancestry back to José Narciso Cavazos, a rancher granted 470,000 acres by the king of Spain in 1792, the largest land grant in South Texas. Most of that land belongs now to the nearby King Ranch.